Episode 4 – Filming Has Begun! 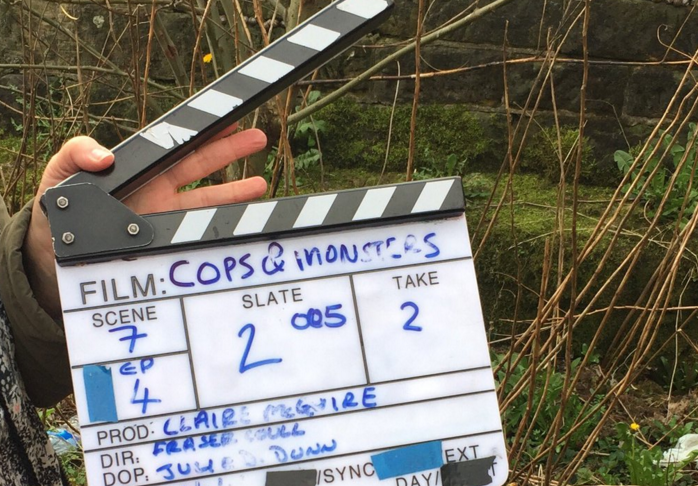 Yesterday we officially kicked off filming on episode 4 of Cops and Monsters! Cast members Kenny Boyle (Martin Carmichael) and Billy Kirkwood (The Cult of Many Faces) met for the first time as they filmed their scenes together for the episode on a quiet road in Partick, Glasgow. New makeup artists Leah and Nadia joined us to make some gruesome makeup work on one of our stars while we worked out and filmed the scenes. Our photographer Sonja was snapping away with a mix of publicity and behind the scenes stills and we will be sharing them with you soon. Claire our producer has been working extremely hard to work within our budget to make sure costumes, makeup, props (and lunch for the crew!) is organised for next weekend’s shoot where we will be introducing new cast member Innes Anderson (Alexis) into the world of Cops and Monsters. We’re cutting together a little teaser from yesterday’s footage and will have it online shortly!